It may not be obvious as these wind driven turbine roof exhaust vents move up to five times more air than the standard roof exhaust vent known as an RV 51. 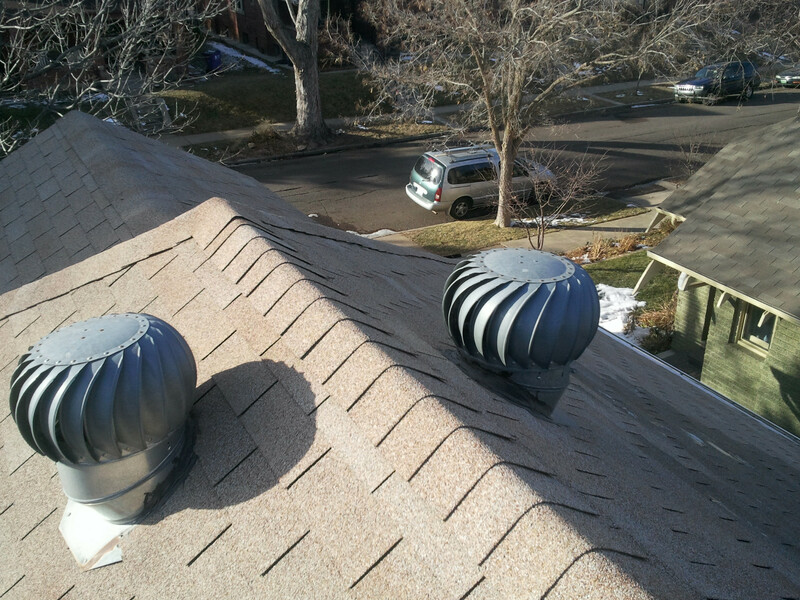 These vents have no corresponding intake vents so they cannot draw attic air effectively. Also, because they are close to each other, they tend to draw outside air from each other instead of the attic. If you are looking for more Summer time relief from the heat and less moisture buildup which can lead to mold and mildew, it is absolutely essential that your attic space have an appropriate balance and configuration between intake and exhaust venting. Proper ventilation will also extend the life of your roof too and improve the over all energy efficiency of your home . Contact 3R Roofing in Boulder, Colorado for a free consultation. This entry was posted in Roof Ventilation and tagged balanced roof ventilation, energy efficiency. Bookmark the permalink.